The neocons provide the feeder system for military cemeteries and Memorial Day grief. Too many tragic military deaths occurred in theaters and battlefields and conflicts that never threatened our freedom or flag. Death does not justify or elevate imperialism and globalist asset-stripping to the noble pursuit. Say no to war, honor those who’ve served and redirect you attention to what patriotism actually connotes. All American war is noble and to be encouraged, applauded and celebrated without question. As we speak some very despicable but brilliant folks are carefully writing the back story of our next military adventure – how it threatens our freedom and is sourced in a hatred for our American way of life. Or something. The theme really isn’t important, your perfervid acceptance as fact is. Count on the theater being Africa. The story will contain graphic depictions of bloodthirsty foreign types with names you can’t pronounce. The scripts will be distributed to the American mainstream media who will dutifully repeat and not report the threats and horrors as specifically written. And it’s off to fighting we go. And, again, you will have questioned nothing. The lithographic print above is one of the earliest forms of WWI propaganda usage in the United States in 1917. 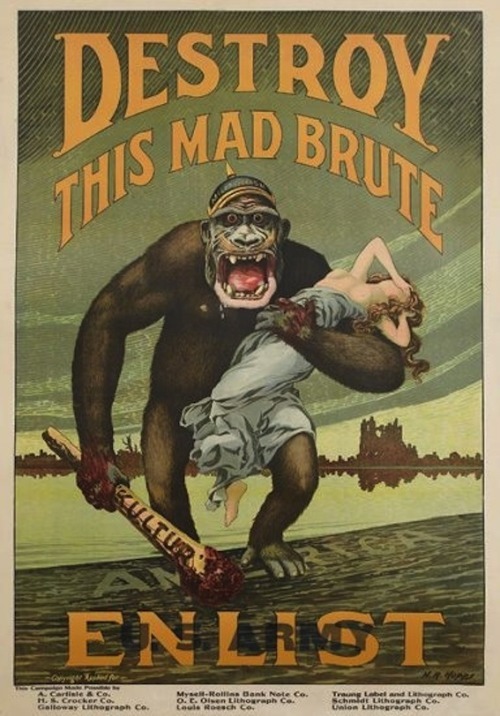 The print was called “Destroy This Mad Brute – Enlist,” designed by H.R. Hopps and printed by Carlisle & Co. It has a dribbling, mustachioed ape wielding a club bearing the German word “kultur,” wearing a pickelhaube helmet with the word “militarism” and is walking onto the shore of America while holding a half-naked woman in his grasp (possibly meant to depict Liberty).